Mirman School reached out to us recently for a new sign they wanted to add to the school campus. They were looking for a custom plaque to commemorate a family that had donated to the school. 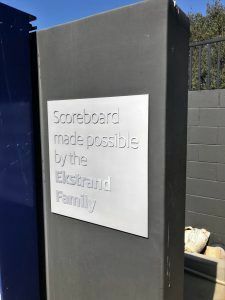 From the photo, you can see that the finished product was a very high-end looking plaque that I’m sure the Ekstrand Family was happy to see displayed on the scoreboard. There are many different types of signs that schools need. When it comes to interior signs, ADA signs are a must. But aside from signs that are mandatory, there are many different types of signs that can improve a campus. Mirman School is an existing customer of our that we have made a few different types of signs for. The largest sign was a reverse-lit channel letter sign of the school logo that we installed at the main entrance to help advertise the school, and to help students, employees, and parents find the location. Then, we made two sets of exterior aluminum dimensional letters for the athletics field and athletics building to commemorate families who had donated to the school. 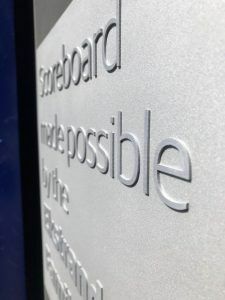 Mirman School is very big on making sure that their donors know that they’re appreciated so we made them a set of large exterior metal plaques that displayed the school logo, a message showing their gratitude to the donors, and a list of the donor’s names. The donor plaques and the scoreboard plaque we made are the same style of sign. The plaque themselves are aluminum. When it comes to metal signs, we like to use aluminum because it is lightweight and easy to work with. Aluminum can be cut, formed, painted, anodized, and more. The background of the plaque is bead blasted, and the letters themselves have a random orbital surface. Metal is also great for signs with a lot of texture because there are so many different finish options.